I only heard wonderful things about the invitation. One friend purposely kept it in her purse for a week to show it off to her friends. CAN YOU REALLY MAIL THESE? Yes, tubes are approved by the United States Postal Service. In fact, they have been mailed all over the world. HOW MUCH DOES IT COST TO MAIL? 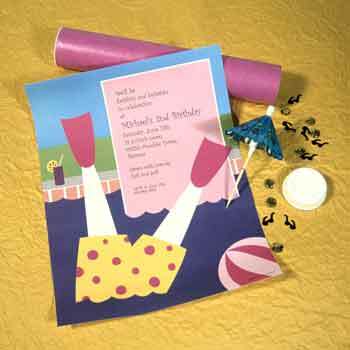 $2.62 per invitation….up to 3 oz of weight. You can often add RSVP’s and direction cards without affecting the postage. Custom designs and greetings may cost more; it depends on the weight of what we are adding to the package. CAN WE MIX AND MATCH ITEMS? Absolutely, that’s part of the fun! When working with our customers we like to get a clear understanding of the event or purpose of the mailing. That way we can suggest minor changes – which usually do not affect pricing – that will make the mailing more effective. For instance, if you prefer a different tube cover or confetti mix, no problem. Often we are the ones to make the suggestion. Depending on what is being substituted, there may be an additional fee or in some instances the price may go down, we’ll let you know. In the end, you decide. We just like you to know that there are options that may be more appropriate for your mailing. I DON'T SEE SOMETHING THAT WORKS FOR US. DO YOU ONLY SELL INVITATIONS & GREETINGS THAT MAIL IN TUBES? No, in fact we have boxes, petri dishes, envelopes and other unique die cut packaging to mail greetings in. We also have hand made items like – paper mache maracha’s and minature cans of soup. Nothing is too crazy! On average orders take 10-14 business days. It does depend on quantity, design and other orders in house. We have turned around RUSH orders in 2-3 days. Even overnighted orders in 1 day. So always call. In some instances rush charges may apply. It just depends. One thing you can be certain of, we’re great under pressure. We have to be in this industry! HELP! I'M SHORT ON TIME, CAN YOU DO IT ALL? and stamps. We’re also happy to mail them at the post office. When you are in a time crunch these services can be a great lifesaver. I HAVE MY OWN ITEM I WANT TO ADD TO THE PACKAGING, CAN WE DO THAT? WE HAVE AN AD CAMPAIGN THAT NEEDS TO TIE IN WITH, CAN YOU HELP? Yes, send us PDFs of the various pieces and logo art. We can design a piece that coordinates with your campaign. You can also supply us with camera ready art that we can print on to the greeting. Please confirm with us how the artwork needs to be supplied. CAN YOU ADD OUR CORPORATE LOGO? logo and we’re happy to add it. I HATE CONFETTI, CAN IT BE LEFT OUT? Absolutely. Though, the majority of our customers mail the tubes with the confetti, we do have clients that it is not appropriate for or they just flat out “hate” it. Sometimes we’ll use confetti but only our “large” style (IE. We have ¾” snow flakes & horses). We do remind our clients that one of the main reasons for using our tubes is the high impact. Part of that is the 3-D packaging but the other is all the “stuff” that falls out. You may hear clients complain jokingly how that “stuff” got all over. . . but I guarantee that this promotion will be the one remembered even years down the road! If we are assembling, and you want confetti in all but a few tubes (because you know those few people “really” wouldn’t like it) we’d be happy to leave confetti out of their tubes. Just give us their names.